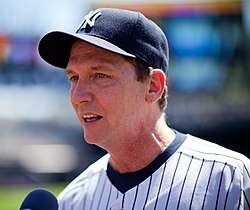 David Brian Cone (born January 2, 1963) is an American former Major League Baseball (MLB) pitcher, and current color commentator for the New York Yankees on the YES Network and WPIX. A third round draft pick of the Kansas City Royals in 1981 MLB Draft, he made his MLB debut in 1986 and continued playing until 2003, pitching for five different teams. Cone batted left-handed and threw right-handed. Cone was born in Kansas City, Missouri, the son of Joan (née Curran; 1936-2016) and Edwin Cone (b. 1934). He attended Rockhurst High School, a Jesuit school, where he played quarterback on the football team, leading them to the district championship. He was also a point guard on the basketball team. Because Rockhurst did not have a baseball team, Cone instead played summer ball in the Ban Johnson League, a college summer league in Kansas City. At 16, he reported to an invitation-only tryout at Royals Stadium and an open tryout for the St. Louis Cardinals. He was also recruited to play college football and baseball. Upon graduation, he enrolled at the University of Missouri and was drafted by his hometown Kansas City Royals in the third round of the 1981 Major League Baseball draft. We saw Howell throwing curveball after curveball and we were thinking: This is the Dodgers' idea of a stopper? Our idea is Randy (Myers), a guy who can blow you away with his heat. Seeing Howell and his curveball reminded us of a high school pitcher. 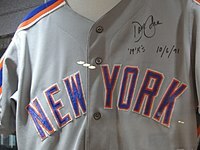 Cone spent over five seasons in his first stint with the New York Mets, most of the time serving as the team's co-ace alongside Dwight Gooden while leading the National League in strikeouts in 1990 and 1991. In 1991, Cone switched from uniform number 44 to 17 in honor of former teammate Keith Hernandez. On August 30, he struck out three batters on nine pitches in the fifth inning of a 3–2 win over the Cincinnati Reds. He became the 16th National League pitcher and the 25th pitcher in Major League history to accomplish the feat. Cone tied a National League record on October 6, in the season finale, by striking out 19 rival Philadelphia Phillies batters in a 7–0, three-hit shutout at Philadelphia. His 19 strikeouts was the second-highest total ever recorded in a nine inning game just behind the 20-strikeout games recorded by Kerry Wood, Roger Clemens (twice), Randy Johnson and Max Scherzer, and tying Tom Seaver's single-game club record, making the Mets the only team with two pitchers to achieve the feat. When the Yankees acquired Cone, they were on a six-game winning streak, though still trailing the Boston Red Sox for the division lead. Cone instantly became the team's ace and would post a 9-2 record as the Yankees won the wild card in the first season of the new three division, wild card format. In his third post-season, Cone won the first game of the 1995 American League Division Series against the Seattle Mariners, and left game five with the score tied at four. The Mariners won the game in extra innings to eliminate the Yankees from the playoffs. He re-signed with the Yankees for the 1999 season for $8 million. He went 12–9 in 1999, pitching the sixteenth perfect game in baseball history on July 18 against the Montreal Expos. It is the last no-hitter to date by a Yankee, and also the first (and so far, only) regular season interleague perfect game. Making the game even more remarkable was that it was "Yogi Berra Day" at Yankee Stadium. After a long feud with owner George Steinbrenner, Berra agreed to return to the stadium that day, and caught the ceremonial first pitch from fellow perfect game pitcher Don Larsen. Larsen could be seen smiling in the press box after the final out was recorded. After the perfect game, he seemed to suddenly lose effectiveness. It was the last shutout he would throw in his career. In 2000, he posted the worst record of his career, 4–14, while seeing his ERA balloon to 6.91, more than double his mark the previous year. In spite of his ineffectiveness, Cone was brought in during game four of the 2000 World Series to face the Mets' Mike Piazza, a controversial decision at the time — Denny Neagle had given up a home run to Piazza in his previous at-bat, but was pitching with a lead and only needed to retire Piazza to go the minimum five innings to be eligible for a win. Cone induced a pop-up to end the inning. It was the only batter he faced in the entire Series. Cone recognized after the 2000 season that his tenure with the Yankees was over. In 2001 Cone pitched for the rival Boston Red Sox, performing with mixed but mostly positive results, including a 9–7 win-loss record and a 4.31 ERA. His 2001 season included a suspenseful 1–0 loss against Yankees ace Mike Mussina wherein Cone pitched ​8 1⁄3 innings giving up one unearned run, keeping the game close even as Mike Mussina came within one strike of completing a perfect game, which would have made Cone the first pitcher to pitch a perfect game and be the losing pitcher in another. Upon retiring from baseball in 2001, Cone became a color commentator on the YES Network during its inaugural season. However, his comeback attempt with the crosstown rival Mets in 2003 infuriated Yankees owner George Steinbrenner and Cone was told he would not be welcomed back. After his second retirement, Cone was offered a broadcasting position with the Mets, but opted to remain home with his family. His wife, Lynn DiGioia Cone, an interior designer whom he married on November 12, 1994, gave birth to a son, Brian, on March 23, 2006. David and Lynn Cone divorced in 2011. Cone is engaged to socialite real estate investor Taja Abitbol; they live in Greenwich Village and have a son, Sammy, who was born on December 15, 2011. ^ a b Profile, yesnetwork.com; accessed February 14, 2015. ^ a b "David Cone Statistics and History". Baseball-Reference.com. Retrieved May 9, 2016. ^ "Imperfect Games". Retrieved May 9, 2016. ^ "Joan Cone 1936-2016". News-Press.com. Retrieved October 21, 2016. ^ 27 Men Out. Retrieved May 9, 2016. ^ a b c d e f Bradley, John Ed (April 5, 1993). "The Headliner". Sports Illustrated. Retrieved December 25, 2017. ^ "Minnesota Twins 5, Kansas City Royals 2". Baseball-Reference.com. June 8, 1986. ^ "New York Mets 8, Atlanta Braves 0". Baseball-Reference.com. May 3, 1988. ^ Joseph Durso (October 7, 1988). "THE PLAYOFFS; Troubled Cone Stops the Press". The New York Times. ^ "1988 National League Championship Series, Game Two". Baseball-Reference.com. October 5, 1988. ^ Russ White (October 8, 1988). "Mets Pressure Cone To Drop Daily Column". Orlando Sentinel. ^ "1988 National League Championship Series, Game Six". Baseball-Reference.com. October 11, 1988. ^ "1988 National League Championship Series, Game Seven". Baseball-Reference.com. October 12, 1988. ^ "New York Mets 7, Philadelphia Phillies 0". Baseball-Reference.com. October 6, 1991. ^ "1992 Major League Baseball All-Star Game". Baseball-Reference.com. July 14, 1992. ^ Bob Klapisch & John Harper (1993). The Worst Team Money Could Buy. Random House. ^ "David Cone". BaseballLibrary.com. Archived from the original on June 4, 2011. ^ John Ed Bradley (April 5, 1993). "Strikeout King David Cone Hopes the News He Makes as a Kansas City Royal Will be About Baseball, Not Off-the-Field Shenanigans". Sports Illustrated. ^ Curry, Jack (July 29, 1995). "BASEBALL; A Day of Deals Bolsters Yankees' Pennant Hopes". The New York Times. 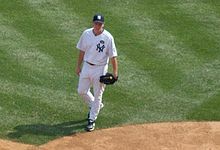 ^ a b c d The David Cone Years, Riveraveblues.com; accessed February 14, 2015. ^ "1995 American League Division Series, Game One". Baseball-Reference.com. October 3, 1995. ^ "1995 American League Division Series, Game Five". Baseball-Reference.com. October 8, 1995. ^ Curry, Jack (December 9, 1995). "BASEBALL;With No McDowell, The Focus Is on Cone". The New York Times. ^ Curry, Jack (December 22, 1995). "BASEBALL;Cone Makes Up His Mind: 3 Years in Pinstripes". The New York Times. ^ Curry, Jack (May 8, 1996). "BASEBALL;Cone Will Have Surgery to Remove an Aneurysm". The New York Times. ^ "New York Yankees 5, Oakland A's 0". Baseball-Reference.com. September 2, 1996. ^ "1996 American League Division Series, Game One". Baseball-Reference.com. October 1, 1996. ^ "1996 American League Championship Series, Game Two". Baseball-Reference.com. October 10, 1996. ^ "1996 World Series, Game Three". Baseball-Reference.com. October 22, 1996. ^ Vecsey, George (October 23, 1996). "Credit Cone With a Save For the Series". The New York Times. ^ Olney, Buster (November 12, 1998). "BASEBALL; Cone Signs One-Year, $8 Million Pact to Stay With Yanks". The New York Times. ^ "David Cone's Perfect Game Boxscore". Baseball-Reference.com. July 18, 1999. ^ Chass, Murray (July 19, 1999). "BASEBALL; On Day Made for Legends, Cone Pitches Perfect Game". The New York Times. ^ "A mid-summer dream". CNN. July 16, 2007. Archived from the original on June 28, 2011. ^ "Most Recent No-Hitters, By Team", Sports Illustrated, June 11, 2003. ^ Baseball Video Highlights & Clips: 7/18/99: David Cone's Perfect Game – Video, MLB.com; accessed February 12, 2015. ^ Torre, Joe; Verducci, Tom. The Yankee Years. New York: Doubleday Publishing. pp. 74–75. ISBN 978-0-385-52740-8. ^ Anderson, Dave (October 29, 2000). "Sports of The Times; Cone Is Given a Moment to Cherish". The New York Times. ^ "200 World Series, Game Four". Baseball-Reference.com. October 25, 2000. ^ Olney, Buster (December 8, 2000). "BASEBALL; No Longer King of the Hill, Cone Departs". The New York Times. ^ "Hip Problem Forces Mets' Cone to Retire". Los Angeles Times. May 31, 2003. ^ Edes, Gordon (June 26, 1994). "Boss Declaring Truce?". Sun Sentinel. Retrieved October 24, 2017. ^ Smith, Chris (October 18, 1999). "Wild Pitcher". New York Magazine. Retrieved May 14, 2012. ^ Amore, Dom (February 10, 2007). "Exit Door Hardest To Open, Birth Of His Son Helped Cone Refocus". Hartford Courant. Retrieved October 24, 2017. ^ David Cone to buy apartment at Greenwich Lane, nypost.com; accessed February 12, 2015. ^ Mushnick, Phil (January 8, 2010). "Cone leaving YES Network". The New York Post. ^ David Cone on Advanced Stats, the End of His Playing Career, and Riding on David Wells's Motorcycle, nymag.com; accessed February 12, 2015. ^ Senate Judiciary Committee website; accessed February 12, 2015. ^ Around, Voices (July 16, 2009). "Live Blogging Sotomayor Hearings, Day 4". The New York Times.